Local disability organisation Veranto has been recognised for its professional and engaging annual report, by winning a bronze award at the annual Australasian Reporting Awards. From hundreds of entries, the southern disability provider was praised for its use of vibrant photos and stories, allowing the judges to gain a full picture of Veranto. 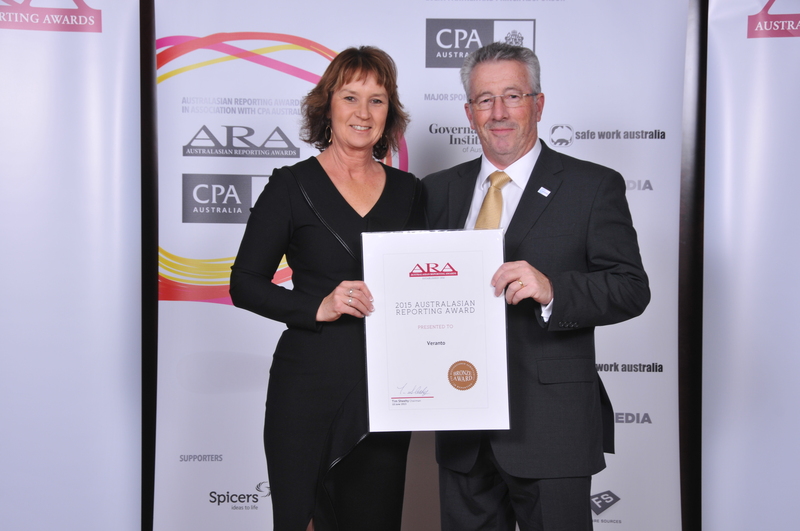 The Australasian Reporting Awards were presented at a gala dinner at Park Hyatt in Melbourne, bringing together businesses acknowledged for their skill in crafting exceptional annual reports in 2013-2014. Veranto Executive Assistant and editor of the winning annual report, Alison Hall, was thrilled with the outcome of the awards. “This was our first nomination in the awards and to be recognised with a bronze is a great achievement, particularly given our limited resources as a not-for-profit,” Mrs Hall said. Ms Hall said Veranto won’t be stopping at bronze. “We received some really helpful feedback from the judging panel, and we will implement those tips into our upcoming report,” said Mrs Hall. To see Veranto’s Annual Report, visit www.veranto.org. To find out more about the Australasian Reporting Awards go to www.arawards.com.au.